It is a complex deformity of spine characterized by abnormal sideways curvature of spine or increased lateral curvature and rotation of vertebrae involving deformity of rib cage. 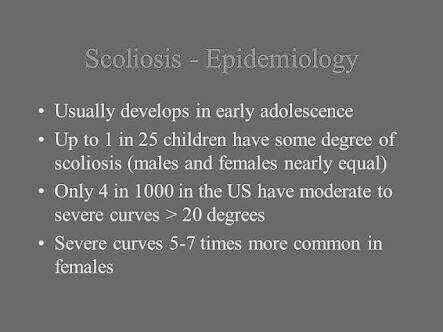 Congenital Scoliosis – bone malformation present at birth. Neuromuscular Scoliosis – results from abnormal muscles or nerves seen in people with spina bifida and cerebral palsy. Degenerative Scoliosis – results from traumatic bone collapse. 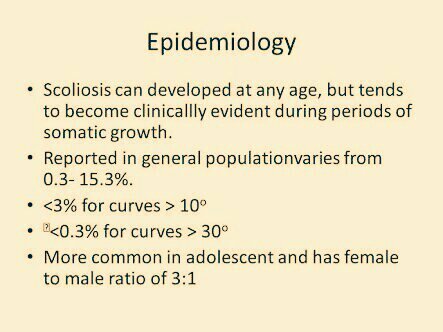 Idiopathic Scoliosis – results from no specified identifiable cause. Idiopathic Scoliosis is associated with CHD7 and MATN1 gene. Congenital scoliosis has been associated with malformation of the spine during 3-6 weeks in utero due to a failure of formation, a failure of segmentation, or a combination of stimuli. 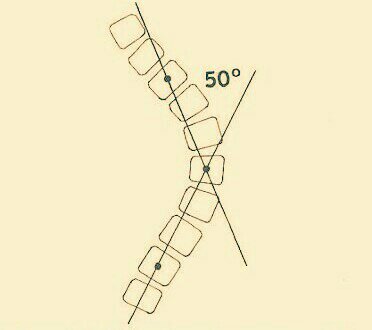 In this a horizontal line is drawn on the upper part of the first vertebrae involved in the curve and a horizontal line is drawn from the lower part of the last vertebrae involved in the curve now a perpendicular line is drawn from both horizontal lines, the angle formed at the intersection is the “Cobb Angle”. 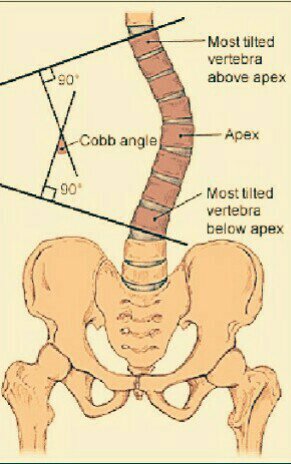 In this method a line is drawn from the centre of the first vertebrae involved and a line us drawn from the centre of the last vertebrae involved in the curve, the point of intersection of these lines gives the Angle of Scoliosis according to Risser Ferguson Method. Bend forward flexion reveals abnormal uneven framework of spine suggestive of Scoliosis. 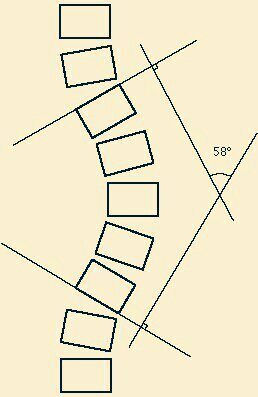 My daughter was diagnosed with a 55 degree lateral curve of the spine this week. She has decided to blog her experience so that other children in her position have a better understanding of the road ahead and that this is not the end.